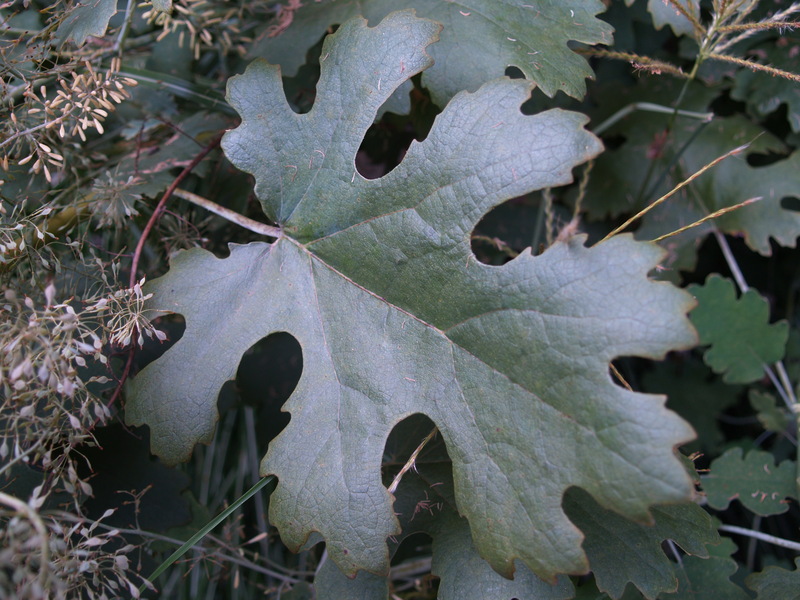 This autumn deer have worn a path beneath one of the large ‘Sekkan Sugi’ cryptomerias, a passage through thick grasses and plume poppies (Macleaya cordata, below) that begins near the swimming pond, where deer often stop to quench their thirst, and ends at the neighbor’s garden. Along the short path there is a wider area where the poppies have been laid down, probably where deer rest and hide in the dense foliage during daylight hours, with an escape route in either direction. Earlier in the year, before the vegetables were planted, the neighbor constructed a tall fence, buried a foot below ground to foil the local groundhogs, and built high enough to deter even the hungriest deer. Thus, the path towards the garden serves only as cover between the tall cryptomerias and the fence as deer pass through the neighborhood. Again this year the garden has escaped significant injury from deer beyond a few broken branches and trampled poppies. From the start of May through October I have sprayed at the first of each month with a repellent, a task accomplished more quickly this year since I began using a one gallon sprayer, though the heavier jug strained a shoulder muscle that pained me for weeks. There is no need to spray every plant in the one acre garden. 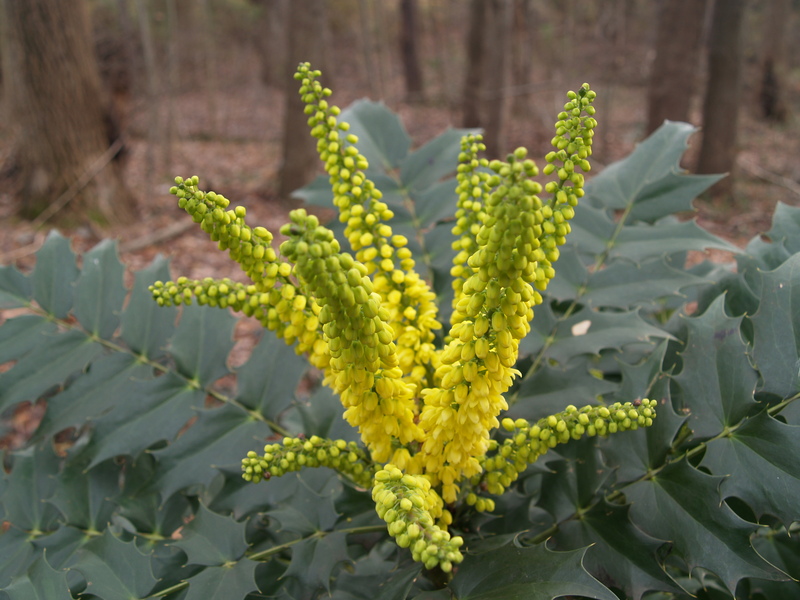 There are a number of small trees with foliage above the deer’s reach, and shrubs and evergreens that they have shown no interest in, some with needles or spines (a spiny mahonia, below), and others that discourage deer with toxic or distasteful foliage, or by foul scent. I alternate two repellents through the year, and have found no difference in the results, so I suspect that any of the available products should be similarly successful. This fifteen minute task once each month through the growing season has allowed the hostas to return to full vigor after a number of years in decline as deer regularly feasted on them. 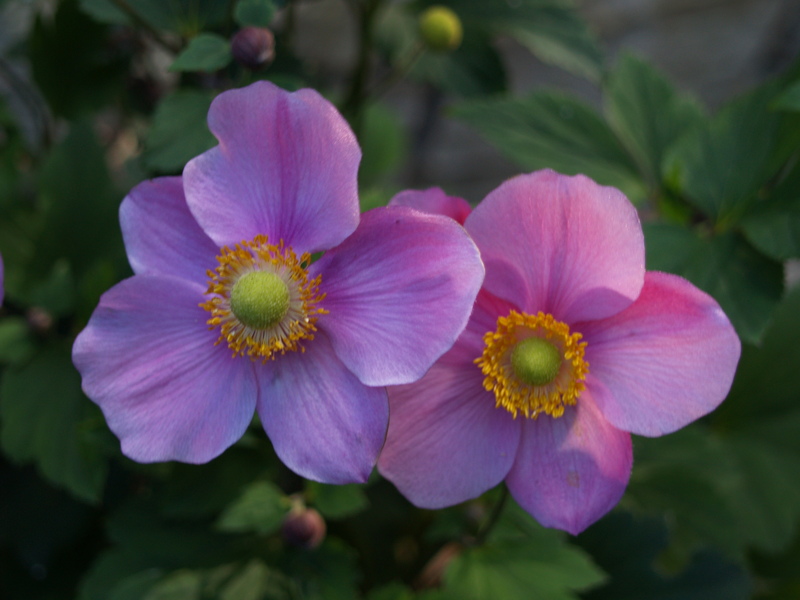 Despite my efforts a few of the coneflowers and Japanese windflowers (Anemone, below) were nibbled on in June as they quickly grew from a few inches in height, and the newer growth was unprotected. Both perennials revived by summer’s end, and bloomed as expected though a bit tardy. I have not resolved which creature is to blame for repeatedly chewing the leaves of both red and yellow leafed sweet potato vines that tumbled over boulders at the edge of the swimming pond. At the first occurrence I figured that deer must be responsible, and in fact they were clear culprits in decimating sweet potato vines in containers on one of the stone patios a few years ago. The positioning of the vines that border the pond makes footing for a large animal quite treacherous, so I am inclined to believe that some smaller critter is guilty, probably rabbits or chipmunks, both of which are numerous. The vines were sprayed with the repellent, but eaten anyway, so while I can attest to the repellents efficacy in protecting against deer, tasty foliage is not reliably safe from other determined creatures. 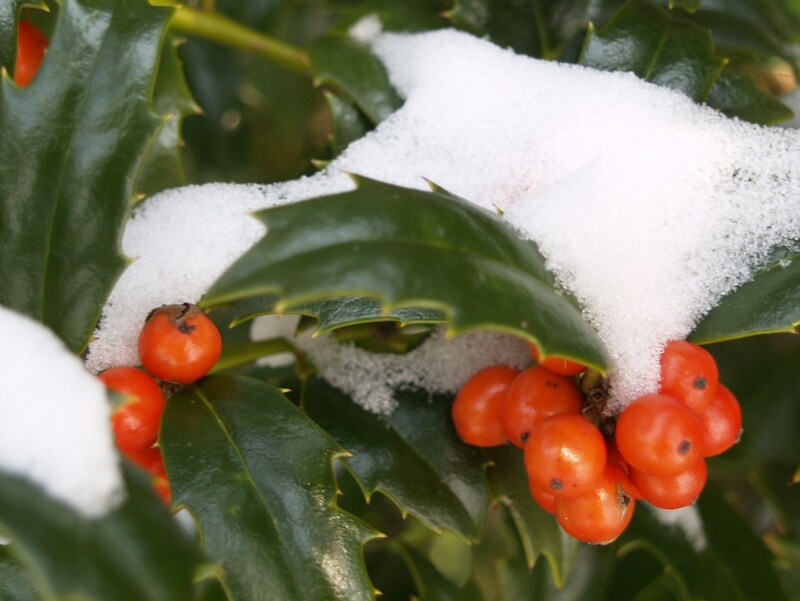 Early in December a heavier concentration of repellent was sprayed on the hollies and arborvitaes that are only susceptible in the late autumn and winter months when more favored foliage is not available. This spray will persist until mid-spring, and then the routine will begin anew with the emerging perennials in May. With my success I have taken a new tone in making recommendations to other gardeners who hesitate to plant one thing or the other due to problems they have experienced with deer. I do not consider deer preferences at all when selecting additions to the garden, confident that the repellent will be completely effective. When I hear from a gardener that repellents worked for them for only a short time, I presume that they did not maintain a monthly routine. Through periods with repeated rainfall I have found that the repellents are dependable for at least a month, and allow a more broad range of plants in the garden. Recently I have read garden forums praising the effectiveness of urban deer hunting, usually in parkland or on large, wooded lots, and by expert marksmen or bow hunters. Consensus on the forums seems to embrace the hunts enthusiastically, but I have seen no reason to believe that this is a realistic solution to deer overpopulation. Regardless of safety concerns, or whether you favor hunting, the numbers of deer “harvested” in these targeted hunts are quite minuscule when compared to best guess estimates of the deer population in an area. 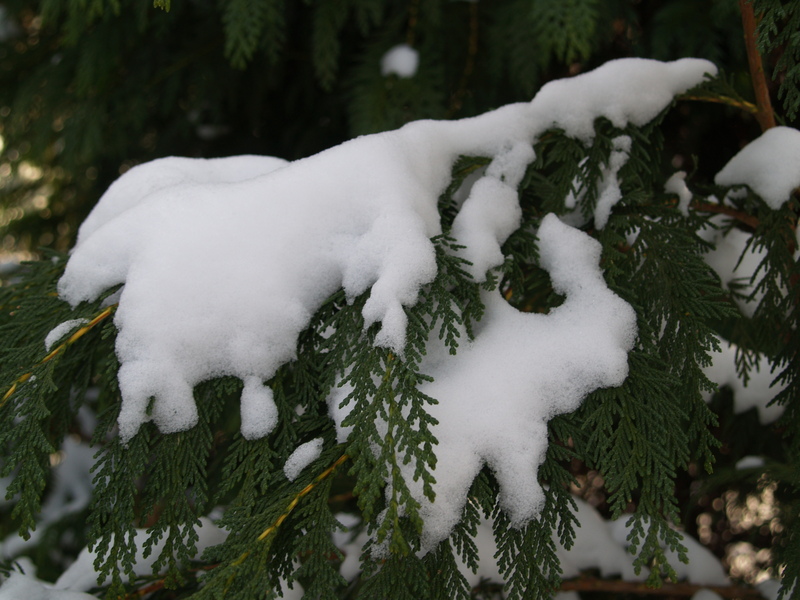 While I have been successful in persuading deer not to eat the plants in my garden, the problem is growing, a threat to undergrowth in our forests, and the safety of our highways. Our gardens are of lesser concern, but one day in the future the availability of food for overpopulated deer might become so scarce that the repellents will not be effective. We found that planting Vinca Vines on one of the hills next to the deer trail has kept them busy. They love the plants because they are green all year. It keeps them away from our other plants & trees. I alternate two repellents, Bobbex and Deer Stopper. I use both only to evaluate them, and I don’t think that there’s any benefit to using two rather than one. The repellents have different formulas, but are equally effective, and I think that many other spray-type repellents are probably just as good. The repellents that I’ve used smell bad and probably taste worse, and to my thinking the repellents based on rotten eggs and the like rather than predator urine (such as Coyote urine) are more likely to meet with success. Both repellents that I use are in concentrate form since I first used a ready-to-spray and quickly saw that it would cost a fortune to spray regularly. The key is to spray every month, and my wife has a note on her calendar to remind me at the first of every month beginning May 1, through the last spray (a double concentration) at the start of November. With a one gallon sprayer the susceptible plants in my large garden are sprayed in a half hour.